In 2007 Simmons acquired the ComforPedic line of memory foam mattresses from Comfor Products, Inc. Comfor Products has specialized in memory foam for over 60 years. Simmons then combined their expertise in pocketed coils with this new expertise in advanced memory foam to produce the Simmons NxG mattress. NxG advanced memory foam is touted as providing fast heat dissipation (there are sometimes complaints by consumers that memory foam can get uncomfortably warm) and quicker recovery from deformation (depressions recover more quickly when you move). The NxG series of mattresses also come with the Simmons Evenloft mattress top that creates a smooth surface thereby allowing one to better feel the comfort layers (this mattress top uses body contouring stretch knit fabric). The Beautyrest NxG series of mattresses have a 980 density of pocketed coils (what this means is that there will be 980 pocketed coils in a queen size mattress – the base size for this measurement is the queen). The pocketed coils ensure limited movement transferred from one partner to another (often referred to as motion separation), they are said to conform to your body shape and provide good support, and they are also quite durable. The coil gauge on the NxG is 15.5. The NxG mattress also has edge support provided by 3 inches of high density foam. The NxG mattresses meet federal fire-retardant safety standards and usually have a 10 year non-prorated warranty (A non-prorated warranty covers full replacement costs of the product during the full term of the warranty. A pro-rated warranty only covers a percentage of the cost of replacement and the percentage becomes smaller as the product gets older). The NxG series are also no-flip mattresses as the cover fabric and comfort layers are only on one side of the mattress. Ratings for these mattresses are hard to come by but the Simmons Beautyrest NxG 400PPT received 6 reviews by consumers at Macy’s and was rated an average 4.2 stars out of 5. Viewpoints reviewers rated the NxG100F 3.67 stars out of 5, but there were only 3 reviews – 2 loved it and 1 hated it citing that the bed was too firm. 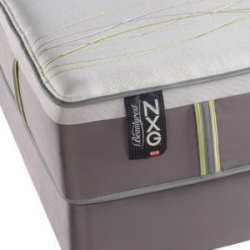 If you are considering a purchase you can find a large selection of Simmons Beautyrest NxG mattresses on Amazon.